Soup have a special place in Turkish cuisine; traditionally meals always start with a soup. For my small family, a hearty soup can be a main course itself with some nice crusty bread next to it. 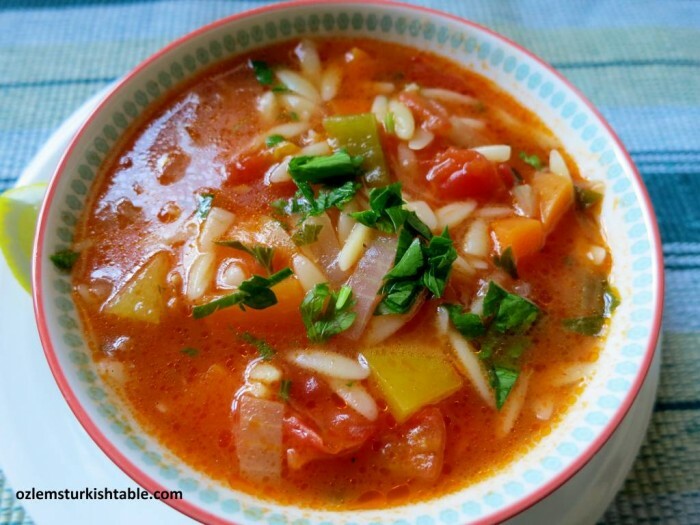 I made this lovely Turkish vegetable soup with orzo pasta today and it went down very well. My son was under the weather and after having the soup, he said, “I love this corba, mummy, just what the doctor ordered!” – best compliment to my ears. Orzo pasta or “sehriye” as we call it in Turkish fits in this soup very well, thickens the broth beautifully and makes it substantial. Being a lemon fan, I give a generous squeeze, with plenty of red pepper flakes or Aleppo pepper over the soup for a delicious heat, when serving. You can also crumble some feta cheese over the top before serving if you’d like too. For a gluten-free option, you can use rice instead of orzo pasta. Many wholesome soups, regional specialties, pastries, vegetables cooked in olive oil and more are included at my cookery book, Ozlem’s Turkish Table, Recipes from My Homeland, available to order at this link, if you are interested in. This delicious vegetarian soup, Sehriyeli Sebze Corbasi, is easy, delicious and wholesome. Orzo pasta or "sehriye" as we call it in Turkish fits in this soup very well, thickens the broth beautifully and makes it substantial. Being a lemon fan, I give a generous squeeze, with plenty of red pepper flakes or Aleppo pepper over the soup for a delicious heat, when serving. You can also crumble some feta cheese over the top before serving if you'd like too. For a gluten-free option, you can use rice instead of orzo pasta. Beautifully colorful soup, perfect heartwarming winter food. Would’ve loved to be in the upcoming class, Ozlem, the menu is a pure treat! xxPeri. It’s def. soups weather here – I could do with a bowl of your çorba now. Merhaba Yatie, thank you so much for your kind note, i am delighted my recipes here are enjoyed by you and your guests, so kind of you to share, thank you! This looks really delicious and especially hearty. Is this a real Turkish recipe, a Turkish classic? It is indeed, a delicious and healthy soup that I have been enjoying with my family since my childhood, hope you enjoy it too, thank you for your note. My family loves çorba to start dinner, too! We always have some before big, extended-family meals. The Mexican way of eating soup sounds similar to this: instead of lemon, chili flakes and parsley, it’s lime, chili sauce and cilantro! “Condimenting” soup is the best way to eat it. Can’t wait to try this recipe, it looks çok güzel! Merhaba Terra, many thanks for your lovely note! Indeed similarities between our cuisines and we love adding flavors with spices, herbs and lemon juice, do hope you enjoy this, afiyet olsun! I’ve just made the soup and can’t wait to sit down later with the family. This soup sounds very healthy and we have a vegan in the family so perfect for him! !